Interested readers can now access my latest Art of Medicine column — When a discharge instruction is overlooked — recently published in the Journal of the American Academy of Physician Assistants. Please note that all of my previously published Humane Medicine pieces can now be accessed here. This impromptu discussion got me to thinking: What does it mean to care for the patient in our age of accelerated technological practice, where computer driven devices allow us to glean volumes of lab values from minute specimens of body fluids; where sophisticated scans enable us to peer inside the living body and tag its idiosyncratic pathologies; where our modern pharmacological armamentarium allows us to treat previously universally fatal diseases with effective drugs and transplanted tissues and organs? Surely, there has never been a time in the history of medicine where the benefits of diagnosis and treatment have shown greater promise than now. And yet, as we surge ahead toward more and greater technological expertise, might we be in danger of losing something in the process? Are we in fact overlooking the whole point of the practice of medicine — to cure sometimes, to relieve often, to comfort always? Have we in fact forgotten that first and foremost the art of medicine rests upon our ability to listen to the patient — and thus impart some degree of healing in the process? A hospitalist colleague e-mailed me his observations on this topic. Doctors are now debating the relative merits of continuing to teach students the art of cardiac auscultation. In 2012 New York’s Mt. Sinai Hospital provided medical students with hand-held ultrasound devices capable of generating real-time images of the heart at the bedside. Such devices have proven to be superior to the physical examination, nearly doubling the likelihood of accurate cardiac diagnoses. There are those who would have us discard the archaic, inaccurate stethoscope for such sophisticated technological tools. I agree with much of what Dr. Edelman has to say. When we as clinicians distance ourselves from the patient — either physically or empathetically — something of the caring aspect of the art of medicine is lost. But I would take it one step further. If we wish to become true healers in our chosen vocation, we must take the time to train ourselves to listen, not only with our ears, but with our hearts as well. For it is only when we listen with the heart that we can truly hope to provide a measure of healing to the patient. While out for a mid-day walk in the biting January cold, I turned the collar of my coat up against the windy gusts that ripped the surface of the river, tore at the branches of the trees and sent dry leaves spinning upwards like whirling dervishes. Standing on the concrete jetty behind the old mill, I suddenly looked up and chanced to see a red-tailed hawk overhead, struggling in flight, making little headway against the wind. Buffeted, he braced, buckled, then barrel rolled directly into the wind; veered, braced, then buckled again; momentarily held tight, then was suddenly swept away, cast off into the southwestern sky, pummeled by a sea of pounding air. “In the first place, I was standing still. Having banked right in order to correct a sudden drift, I saw the landscape freeze abruptly where it was and remain jiggling in the same spot. I was making no headway. My wings had ceased to nibble into the outline of the earth. “There was no longer a horizon. I was in the wings of a theatre cluttered up with bits of scenery. Vertical, oblique, horizontal, all of plane geometry was awhirl. “Whenever I seemed about to take my bearings a new eruption would swing me round in a circle or send me tumbling wing over wing and I would have to try all over again to get clear of all this rubbish. “I was wrestling with chaos, was wearing myself out in a battle with chaos, struggling to keep in the air a gigantic house of cards that kept collapsing despite all I could do. “The first blow sent me rolling over and over and the sky became a slippery dome on which I could not find a footing. For me, it was much the same with the hawk. 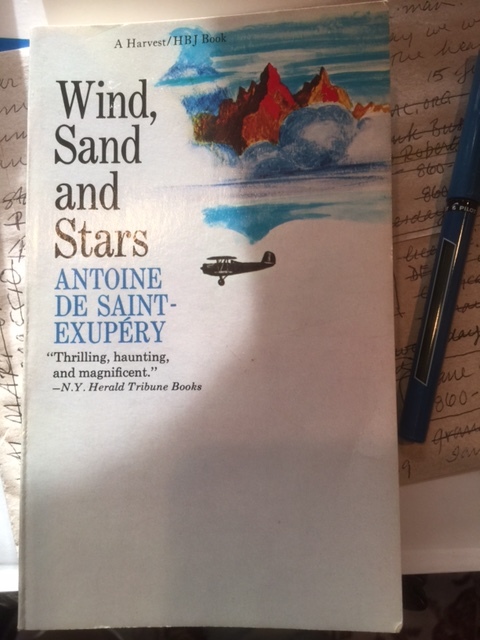 “The Elements” in Wind, Sand and Stars, pp. 58-68. With today’s high just above freezing, I set out on a mid-day jaunt about the village, determined to shake off the winter doldrums and stretch my legs. A thin veil of snow carpeted the landscape below a brilliant blue sky. Down at the great bend in the river a gaggle of Canada geese sounded spontaneous greetings to others in flight overhead, while a pair of Mallards paddled quietly near the entrance to Pickerel Cove. Further downstream, two Mergansers rode the swift current before rounding up into an eddy swirling by the far bank. The river had dropped appreciably over the past several days, leaving intricate ice formations on debris along the water’s edge. I snapped these photos of aeolian ice harps poised for an afternoon concert.